This is BMW’s radical all-wheel drive petrol-electric hybrid i8 sports car, which is undergoing final cold-weather testing before it is revealed in production form towards the end of the year. The styling of production version of the i8 differs considerably from the two previous concept versions, but it retains the same overall silhouette and the same unusual ‘fins’ in front of the wheels which help steer the airflow over the wheels to reduce drag. At the rear, it also retains the separate wheel housings, which stand away from the rear bodywork. Airflow is channeled behind the wheels and under the large tailgate spoilers. The centre tunnel of the i8 is made from aluminium, as are most of the front and rear suspension components. The whole of the body shell - dubbed the ‘Life Module’ by BMW - will be made from carbon fibre, itself manufactured by Co2-free hydropower in Washington State. Unusual aerodynamic flourishes aside, the i8 not only has the look of a scaled-down Audi R8 but should have supercar performance to match. In its showroom guise, the i8’s rear wheels will be powered by BMW’s new 1.5-litre three-cylinder turbocharged petrol engine, which will be good for 215bhp and 220lb ft. The car’s front wheels are driven by a 128bhp electric motor. With both engines - and both axles - being driven, there’s 343bhp on tap and a substantial - though as yet undisclosed - amount of torque. 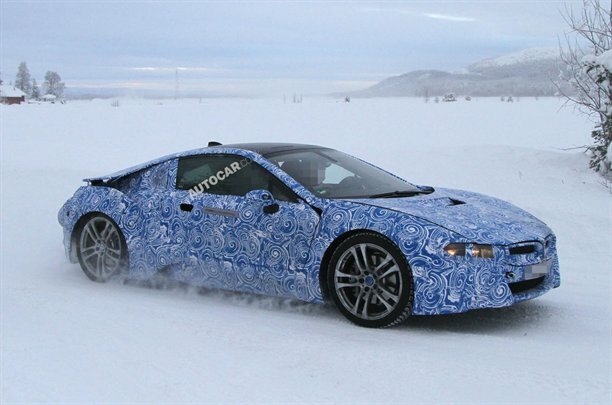 Early estimates suggest the i8 will hit 60mph in just 4.6 seconds. 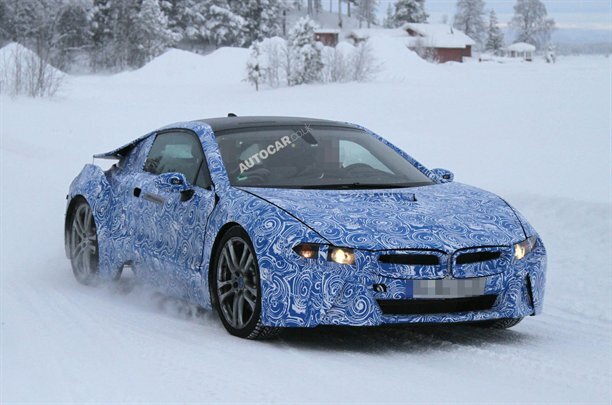 In pure-electric, front-drive, mode the i8 is powered by a lithium-ion battery pack. With a potential range of about 22 miles, it is placed along the centre tunnel of the car. 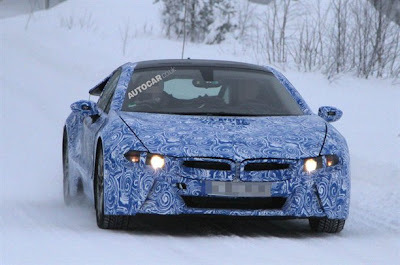 Sources say that the BMW i3 urban electric car will go on sale first, followed by the i8 sometime in 2013. There is an outside chance the the production versions of both models will make an appearance at the London Olympics this summer, for which BMW is the official vehicle supplier.